Everyone needs a workbench. 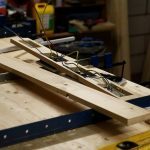 If you have tools and you use them for anything more than hanging the occasional picture or tightening the occasional bolt, you’re going to hit the point where you want a workbench. The question then becomes, what do you make your workbench out of? True dedicated woodworkers often use an actual woodworking bench, which is made of hardwood; usually maple. 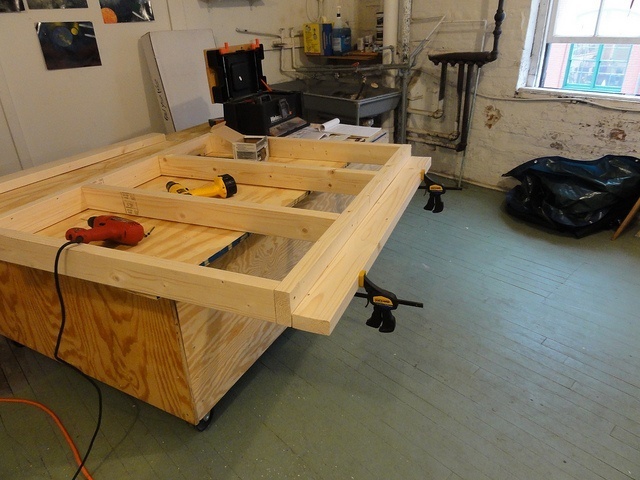 But that’s a different sort of a workbench, intended to be more of a clamping and holding fixture, than anything else. Even if you have one of those wonderful benches, you may not find it to be enough. You’ll probably need something else against the wall, whether as someplace to put things or someplace to mount benchtop tools. These workbenches aren’t usually made of hardwoods, although they can be. But building a hardwood workbench is an expensive proposition and few people want to lay out that much money for one. So, some sort of plywood becomes the material of choice for the bench top, regardless of whether the legs are of wood or of metal. •	MDF – MDF is a great material, very ridgid and strong. It is basically unaffected by moisture, but will swell up if the surface becomes wet. For that reason, MDF should only be used as a sub-layer, with something else on top. •	Softwood Plywood – Softwood plywood is actually the most common material used, simply because of its availability and low cost. The problem is that it is more easily damaged than some other materials. However, if you drop a piece from a project on a softwood plywood bench top, you are not likely to damage the workpiece. So, in that case, the weakness becomes a strength. •	Hardwood Plywood – Hardwood plywoods are the best possible choice, combining strength, moisture resistance and a smooth, hard surface. While more expensive than softwood plywoods, the extra expense is worth it to have a surface that is more durable. Avoid oil plywood, as it has more of a tendency to splinter. A fine-grained hardwood is better. •	Masonite – While masonite is not strong enough to be the workbench top itself, you can cover the top with masonite, providing a smooth surface. When the masonite becomes damaged, it’s easy to remove and replace, keeping the rest of your workbench intact. The best way to build your workbench is to create a laminate, either with two layers of 3/4″ softwood plywood or MDF, perhaps topped by a thin layer of hardwood plywood or masonite. That way, you have enough thickness to give you strength, while providing yourself with a surface that is easy to change out if it gets damaged. You want to avoid using any sort of finish on the top of the workbench, as that finish could rub off onto the projects you are working on, or soak into the pores. This would end up spotting or ruining the finish on your project. One thing to keep in mind, if you do woodworking, is that no matter how well you build your plywood workbench, the top is not going to be as smooth and flat as a hardwood woodworker’s bench. So you really don’t want to use it as a clamping surface, especially for large items such as tabletops or doors. For those, you really do need the woodworker’s bench.